1890 – At Auburn Prison in New York, the first execution by electrocution in history was carried out against William Kemmler, who had been convicted of murdering his lover, Matilda Ziegler, with an axe. Electrocution as a humane means of execution was first suggested in 1881 by Dr. Albert Southwick, a dentist. Southwick had witnessed an elderly drunkard “painlessly” killed after touching the terminals of an electrical generator in Buffalo, New York. In the prevalent form of execution at the time – death by hanging – the condemned were known to hang by their broken necks for up to 30 minutes before succumbing to asphyxiation. 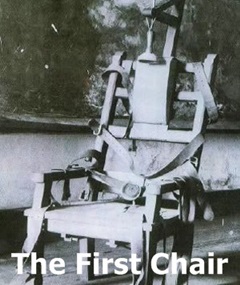 After Kemmler was strapped in, a charge of approximately 700 volts was delivered for only 17 seconds before the current failed. A second charge of 1,030 volts was applied for about two minutes, whereupon smoke was observed coming from the head of Kemmler, who was now clearly deceased. An autopsy showed that an electrode attached to his back had burned through to the spine. 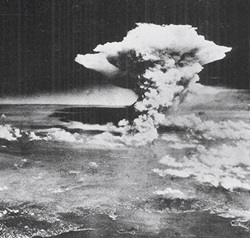 1945 – At 8:16 a.m. Japanese time, an American B-29 bomber, the Enola Gay, dropped the world’s first atom bomb over the city of Hiroshima. President Harry S. Truman, discouraged by the Japanese response to the Potsdam Conference demand for unconditional surrender, made the decision to use the atom bomb to end the war in order to prevent what he predicted would be a much greater loss of life were the United States to invade the Japanese mainland. 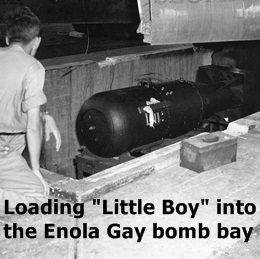 On August 5, while a “conventional” bombing of Japan was underway, Little Boy (the nickname of the bomb), was loaded onto Lt. Col. Paul W. Tibbets’ plane on Tinian Island in the Marianas. Tibbets’ B-29 left the island at 2:45 a.m. on August 6. Five and a half hours later, Little Boy was dropped, exploding 1,900 feet over a hospital and unleashing the equivalent of 15,500 tons of TNT. There were 90,000 buildings in Hiroshima before the bomb was dropped; only 28,000 remained after the bombing. Of the city’s 200 doctors before the explosion; only 20 were left alive or capable of working. There were 1,780 nurses before; only 150 remained who were able to tend to the sick and dying. Hundreds of schoolgirls were clearing fire lanes in the event of conventional incendiary bomb attacks. They were out in the open when the Enola Gay dropped its load. Approximately 80,000 people were killed as a direct result of the blast, and another 35,000 were injured. At least another 60,000 would be dead by the end of the year from the effects of the fallout. 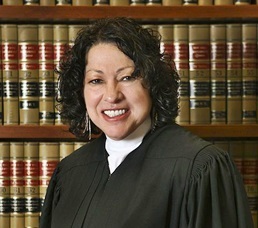 2009 – Sonia Sotomayor was confirmed as the first Hispanic Supreme Court justice by a Senate vote of 68-31. During her tenure on the Supreme Court, Sotomayor has been identified with concern for the rights of defendants, calls for reform of the criminal justice system, and making impassioned dissents on issues of race, gender and ethnic identity. Judge Sotomayor has a unique history of political nominations. She was nominated to the U.S. District Court by George H.W. Bush, a Republican president; promoted to the Federal Court of Appeals by Bill Clinton, a Democrat; and nominated for the U.S. Supreme Court by Democrat Barack Obama. 2011 – Insurgents shot down a U.S. military helicopter in Afghanistan, killing 38 onboard, including 30 Americans. 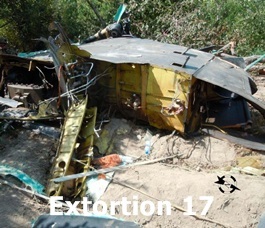 The helicopter, a U.S. CH-47D Chinook military helicopter operating with the call sign “Extortion 17” (pronounced “one-seven”) was coming to the rescue of a team on a mission to capture a senior Taliban leader. It crashed after a Taliban fighter hit the aft rotor blade with a rocket-propelled grenade, resulting in a severe mechanical and dynamic imbalance that spun the Chinook out of control. The crash, the worst single incident for the U.S. in Operation Enduring Freedom – Afghanistan, killed everyone on board, including 25 U.S. special forces soldiers as well as the crew and eight elite Afghan commandos. Most of the soldiers were in the same Navy Seal Team Six unit that killed Osama bin Laden in May 2011, although none involved in the crash were believed to be part of the bin Laden operation. Air Force Captain Joni Marquez, who was the firing officer on an AC-130 gunship which accompanied Extortion 17 on the flight, claimed that the gunship was denied permission to engage Taliban on the ground. Captain Marquez claimed that if the AC-130 been allowed to fire on enemy insurgents on the ground, Extortion 17 would not have been shot down.